Sign-up now to take advantage of the sponsorship opportunities for the NAMA Boot Camp, August 21-23, in Kansas City. Take a look at the available sponsorships below then fill out the on-line sponsorship form at www.nama.org/programs/bootcamp-spo.htm to submit your request to NAMA or contact Jenny Pickett at jennyp@nama.org for sponsorship information. The NAMA Chicago and Heartland Chapters are having a joint, half-day event highlighting the best practices to enhance advocacy efforts in agriculture. Two guest speakers with successful experience will help you increase your understanding of how to become an advocate for agriculture. This is more important than ever with the new Farm Bill and Energy Policy currently being developed in Washington, D.C. The half-day event will take place on May 17, 2007 at the Holiday Inn Hotel & Suites Bolingbrook from 1:30 to 4:00 PM. A networking reception will take place immediately following conclusion of the event. There is no cost to attend and all are invited to bring a guest. Please R.S.V.P to Kim Lynch, President, Chicago Chapter of NAMA at 630-505-1100 or kim_lynch@rkconnect.com or Amy Bradford, President, Heartland Chapter of NAMA at 309-557-6116 or abradford@growmark.com. Get an insider’s look into the world of Cabela’s marketing, including a discussion on target audiences, store location strategy and the overall marketing mix strategy. Plus there’ll be an open Q&A for you to take your best shot at better understanding Cabela’s market strategy. Set your compass due Northwest of the Twin Cities to the Cabela’s store in Rogers, MN, on Thursday, May 17. Registration begins at 3:30 p.m. and the event is free! Please RSVP to Josh Krenz at jrkrenz@landolakes.com. Join Iowa NAMA for the 2007 Iowa NAMA Golf Outing, May 24, 2007. Even if you don’t golf, you are welcome to come out for the social event. Your participation at every level helps to raise funds for your Iowa NAMA Chapter’s student scholarship program. Golfers will participate in a shotgun start and tee-off is 11:00 a.m. There will be prizes for a number of different achievements, like closest to the pin, longest drives, best group score and more. So come for the golf or just come for the fun. Either way, if you show up, the Iowa NAMA student scholarship program wins. The social is from 4-7 p.m.
Get your teams together or we can place you in a group. Simply fill out the registration form and fax it to 515-222-4414, or call REL at 515-224-6389 and simply say, “I’m signing up for the golf outing.” You can also go to www.relonline.com and click on the Iowa NAMA Golf Outing link in the news section and complete your registration form electronically. This year’s Badger/Chicago NAMA Golf and Dinner Outing will be held on Thursday, May 31, 2007, at the popular Hawks View Golf Club in Lake Geneva, WI. Cost is: Golf and Cookout: $95.00; Golf Only: $80.00; Cookout Only: $20.00. Please RSVP by May 23 to Jon Anderson at 414-227-1000 or via email at janderson@openroads-bgdn.com. Download the Golf Outing Brochure and reservation form at www.nama.org/chapters/badcnagolf.pdf. Join Midlands NAMA, Tuesday, June 5, 2007 at the Iron Horse Golf Club in Ashland, NE. Bring a foursome or we’ll pair you up. Everyone is welcome, including non-members! Bring co-workers, clients or spouses. A day full of fun, prizes, lunch, cart and green fees all for $70! For complete registration information contact: (RSVP by Thursday, May 31st) Jim Martin, jmartin_hpj@hotmail.com, 402.289.1734. Preparations are in motion and the date is set for the 2007 Iowa NAMA Field to Food Run. The event will take place on June 15, 2007, at 6:00 p.m. Iowa NAMA will be partnering with Johnston Green Days, an annual community celebration held in Johnston, IA. Through this partnership, the Run will be incorporated into the festivities for Green Days instead of being a stand-alone event. Iowa NAMA is looking for involvement with promotion, race setup, sponsorship, and food. Please contact Roxi Beck for details at roxi@cmakc.com. Join North Central NAMA for their 2007 Golf Outing, Thursday, June 21 (the first official day of summer!). Registration begins at 9:00 a.m. and tee-off time is 11:00 a.m. This will be a 4-person scramble format and the cost is $100 per player. Cost includes golf, cart, range balls, dinner and great prizes. If you would just like to attend the dinner, the cost is $30. Hole Sponsorships are available for $200 (includes one golf registration and a hole sign with logo). For more information or to register a team, contact Troy Schroeder, Broadhead + Co., at tschroeder@broadheadco.com or at 612.617.7930. MoKan NAMA will again host an Ag Tour prior to the NAMA Boot Camp on Tuesday, August 21. The tour will depart from the Hyatt Regency Crown Center at 8:30 a.m. The tour will return to the hotel by 4:00 p.m. and includes lunch and refreshments. The cost for the tour is $45. For more information on the Ag Tour and the NAMA Boot Camp, visit http://www.nama.org/programs/bootcamp.htm. Two of three regional leader workshops have been scheduled for this summer. If you are a leader in your chapter, you will benefit by attending a regional leader workshop. The workshop is considered a “must attend event” for chapter leaders and committee chairs or anyone who may be interested in joining your leadership team. You won’t be disappointed in the time you invest. The leader workshop is an interactive workshop. Chapter leaders will spend time discussing topics relevant to their chapter. Programming, membership, and communication are just a few of the topics that will be discussed. The Region IV Workshop has been scheduled for Thursday, May 31, prior to the Badger NAMA Golf Outing at Hawk’s View Golf Club in Lake Geneva, WI. The workshop will take place from 8:30 – 10:45 a.m. The Region III workshop has been scheduled for Thursday, June 21, prior to the North Central Golf Outing at Crystal Lake Golf Club in Lakeville, MN. The workshop will take place from 8:30 – 10:45 a.m. Region II has not yet set a date for their regional workshop. If you have any questions feel free to contact the NAMA office at 913-491-6500. Make the most of your membership by taking a committee role at the chapter level. Gain hands-on leadership experience that will benefit you in your professional and personal life. Chapter leaders are currently recruiting committee members. If you are interested in becoming a member of a chapter committee, contact your chapter president. A list of chapter presidents can be found at http://www.nama.org/chapters/chapters-index.html. Note: Chapter Presidents, if you have your leaders selected for the upcoming 2007-2008 program year, please submit them to Linda Schaefer at the NAMA office at lindas@nama.org. More than 600 kids from across the Kansas City Metro area learned that food doesn’t come from the grocery store. 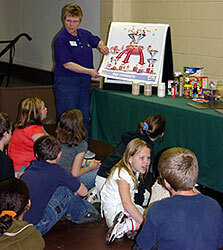 They learned the origin of everything from crust to cheese to tomato sauce at an agricultural pizza party on Tuesday, March 27.The students and a number of educators got a hands-on lesson as part of the 2007 bi-state observance of National Agriculture Day (Ag Day) at the National Agricultural Center and Hall of Fame in Bonner Springs, Kansas. 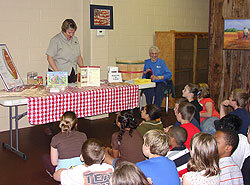 They began by studying six stations focused on each ingredient – dairy, meat, vegetables, wheat, etc. After the students learned about the ingredients that go into making the food they eat, they gathered to eat pizza and ice cream. 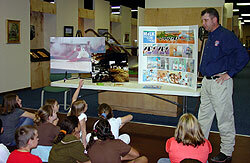 This celebration concluded with magician Rex Getz’s “Magical World of Agriculture” presentation. The Kansas/Missouri Ag Day Pizza Party is held in conjunction with National Ag Day – an annual celebration of the many men and women who provide Americans and others worldwide with food, fiber and fuel. While promoting unity in the food and agricultural community, National Ag Day provides an opportunity for the non-farm public to learn more about agriculture and its vital role in their lives. “This ag program helps educate millions of consumers each year by sharing how agriculture provides almost everything we eat, wear, use and even fuel our vehicles with,” Schlageck said. A special ‘thank you’ goes to the National Agriculture Center and Hall of Fame for serving as host. Thanks to the MidWest Dairy Association; Missouri and Kansas Soybean Associations; Kansas Wheat Commission; Kansas and Missouri Beef Industry Councils; Missouri Pork Association; Missouri Department of Agriculture and the Missouri Vegetable Growers. 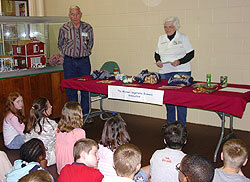 Each student gained information about agriculture’s role in pizza by participating. The Tongonaxie FFA members do an outstanding job helping with this program. Their tasks are varied but they are always willing to step up to do what needs to be done. Our appreciation goes to them and their advisor Randy Kraft for their willingness to assist. Just a reminder to mark your calendars for the Best of NAMA Entry Deadline, October 12, 2007. In addition, the 2007 Agribusiness Forum will take place November 13-14, in Kansas City. The Agribusiness Forum will be held at the Hyatt Regency Crown Center in Kansas City. Once again, the Forum will dovetail the Regional Best of NAMA judging and the NAFB convention. Keep watching the National NAMA e-News for the activities and sessions happening at the Forum. New mp3 audio presentations from the 2007 Agri-Marketing Conference in Dallas are now available. If you were a registered attendee of the conference, you were sent the password to access the files. If you were not a conference attendee, you can order presentations at http://payment.nama.org/07conferencepresent.htm. If you were a conference attendee and misplaced your password, please e-mail Kathi Conrad at kathic@nama.org. Rex Parsons, 82, of Overland Park, Kansas, passed away Sunday, May 6, 2007. Rex was born May 23, 1924 in Akron, Kansas. He served in the Army Air Force during WWII. Following the war he received BA and MA degrees in Journalism from Kansas State University. He had a distinguished career as a writer, editor, publisher and advertising executive in the agriculture industry. Arrangements: Porter Funeral Homes & Crematory,8535 Monrovia, Lenexa, KS (913) 438-6444. Memorial services will be 7:00 P.M. Thursday, May 10 at Valley View United Methodist Church. In lieu of flowers, the family suggests memorials to Kansas City Hospice or Valley View United Methodist church. It was a very long, cold winter and now it’s time for some summer fun and networking with your friends and peers on the golf course or at your local chapter meeting. This spring and summer is host to many golf outings and chapter meetings that will keep you out of the office and in the warmth of a NAMA event. Check out the NAMA Calendar of Events at http://www.namablog.org/?page_id=16 to locate a Golf Outing or Chapter Meeting near you! Mark your calendars to attend the 4th Annual NAMA Boot Camp, August 21-23, in Kansas City! This year’s Boot Camp will kick-off on Tuesday, August 21, at 8:00 a.m. with an optional day-long farm tour. Following the tour, registration for the Boot Camp will open along with a chance to network at the welcome reception. After the reception, enjoy dinner followed by a session on Speed Networking. Wednesday, August 22, begins with breakfast and a general session with a Producer Panel. After the general session, line up for one of two breakout sessions. These breakouts will focus on Research and Trade Shows. Join us for a luncheon session on AgriTourism after the breakouts. The afternoon will begin with breakouts on BioSecurity and Shifting Demographics, and the final session of the day will be a client/agency panel discussion. Following the last session, join us at The Cashew in downtown Kansas City for a networking reception. Thursday, August 23, will kick-off with breakfast followed by breakout sessions on the Farm Bill and New Media followed by the Boot Camp Closing Session. To register for the 2007 NAMA Boot Camp visit, http://payment.nama.org/bootcamp07.htm. For more information on the NAMA Boot Camp visit, http://www.nama.org/programs/bootcamp.htm. Chapter leaders are currently recruiting committee members. If you are interested in becoming a member of a chapter committee contact your chapter president. A list of chapter president’s can be found at http://www.nama.org/chapters/chapters-index.html. Note: Chapter President’s, if you have your leaders selected for the upcoming 2007-2008 program year, please submit them to Linda Schaefer at the NAMA office at lindas@nama.org.